MANILA, Philippines - Tropical depression 'Ambo', the first cyclone to enter the Philippine Area of Responsibility (PAR) this 2016 has maintained its strength and now heading towards Aurora province, state weather bureau PAGASA announced on Sunday night, June 26. At 7:00 p.m. today, the center of 'Bagyong Ambo' was estimated based on all available data at 120 km North of Daet, Camarines Norte (15.1°N, 123.4°E). 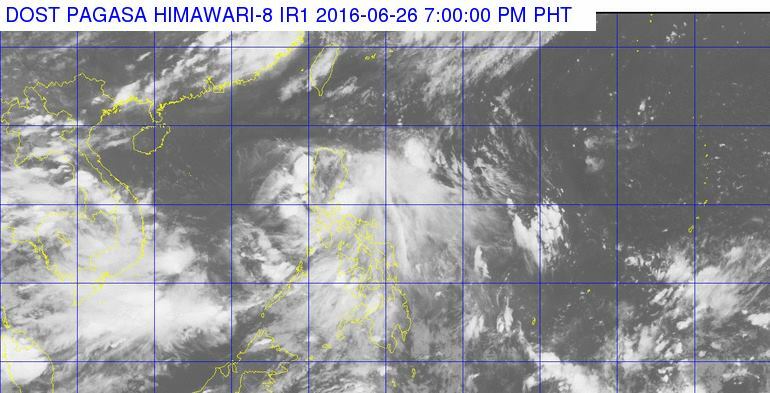 It has maximum winds of 45 kph near the center and forecast to move West Northwest at 22 kph. Tropical Cyclone Warning Signal (TCWS) No. 1 (30-60 kph is expected in at least 36 hrs) in the following areas of Luzon: Catanduanes, Camarines Norte, Northern Quezon including Polillo Islands, Aurora and Quirino. The estimated rainfall amount is from 2.5 – 10 mm per hour (moderate-heavy) within the 200 km diameter of the Tropical Depression. 'Ambo' is expected to weaken after making landfall over Aurora province early morning tomorrow, June 27.